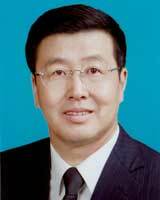 Responsible for Central Government’s relations with the non-Han Chinese citizens of China. Career: After joining the Communist Party in 1981, was posted in Inner Mongolia where he spent his entire political career to date, ultimately becoming Governor of Inner Mongolia from 2009 – 2016 before taking up the role of Chair of State Ethnic Affairs Commission. Prospects: State Ethnic Affairs Commission role is normally held by an official of “minority” ethnicity, but position-holders do not necessarily rise further. Relevance to Tibet: Responsible for Central Government’s relations with the non-Han Chinese citizens of China. This entry was posted in Profiles and tagged China, Chinese Communist Party, Chinese People's Political Consultative Conference, Ethnic Affairs, State Ethnic Affairs Commission, Tibet, Wang Zhengwei. Bookmark the permalink.